Polished Nickel Buckle- 1 1/8"
The misconception of a belt as a simple piece of leather that holds pants in place will fall away the moment you lay hands on a hand-crafted English Bridle belt. Instantly adding class and a unique feel, your view on dresswear will change forever once you experience the passion hand sewn into each stitch. Each belt begins by hand cutting a strap from a thick 12 oz. English Bridle hide before being split down to a more elegant weight. Special care is given to the inner padding as the edges are beveled and the tongue is paired to a taper to ensure it glides effortlessly through the keep. In addition to creating the eye-catching raised look, the padding adds structure to the belt that increases durability. The top and and inner layers are then joined with a full grain vegetable tanned leather lining before being hand sewn together with the finest linen thread using the incomparably strong and beautiful saddle stitching technique. At seven stitches per inch, each belt contains upwards of 550 stitches and over 750 at nine stitches per inch, each done completely by hand. The edges are then coated with multiple layers of edge paint and heat treated to create the smooth finish that completes the belt. For an added personal touch, the inner lining can be customized to include your full name, initials, or another artistic design. If you're looking for an addition to your dresswear that will turn heads and give you a story to tell, look no further. 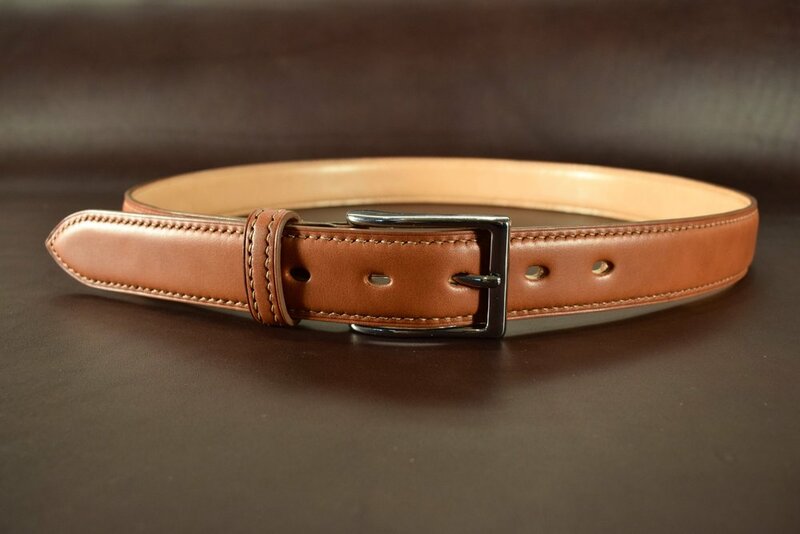 Begin the process of creating your custom-tailored belt today. Belt size is different from pant size. For the best fit, measure a belt you currently use according to the measuring guide linked in the description. If you don't know, type "not sure" and I'll do my best to help you determine the correct size.